Despite Cox’s support of the League of Nations — which earned him Mary Woolley’s vote — Harding’s “America first” campaign ultimately culminated in a landslide victory with 76 percent of the electoral vote. The first page of the Nov. 5, 1920 issue announced the winner along with “The Straw Vote,” a student and faculty poll which showed that students had overwhelmingly voted for Harding (512:187) and faculty for Cox (50:33). The students had won their first election. Last fall was different. 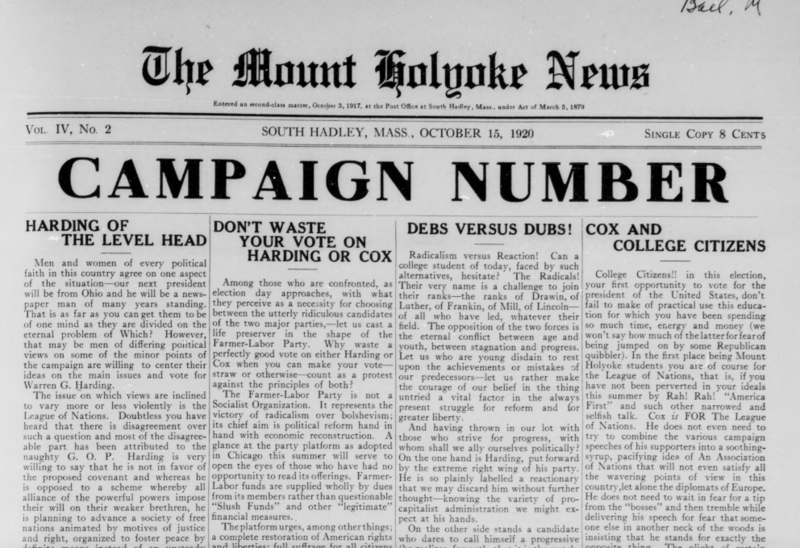 In the 2016 election, the majority of Mount Holyoke students supported Secretary Clinton. Some lost hope when the Democrats lost Florida, some held out until Pennsylvania went red. Others stuck it out until 2:30 a.m., when Donald Trump’s victory in Wisconsin pushed him over 270 electoral votes. In the end, the executive board decided to scrap the paper entirely. Arts & Entertainment, Sports and Books did not run that week. News, Campus Life and Global got to work redoing their sections to focus on the election. Op-Ed would now be “dedicated to providing a platform for voices from the Mount Holyoke community,” according to the executive board’s statement. By dinner time, the newsroom was full of activity. Staff rallied, workshopping articles with first-time contributors and helping the board reach out to organizations on campus.The original plan was to run eight pages, but they eventually filled 12. Op-Ed alone contained 13 articles, two statements from student orgs and a message from the newspaper’s executive board.